The first week of a New Year can often be a tough time, as you drag yourself out of the festive period and back into some form of reality. 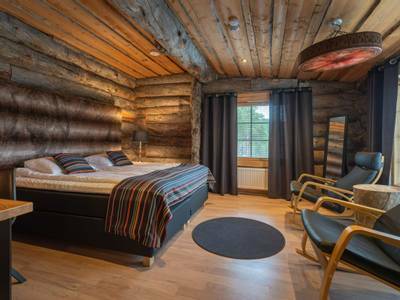 Well, in my opinion, you should forget about all that for a little longer and gently ease yourself into the year in a boutique hotel, far above the Arctic. 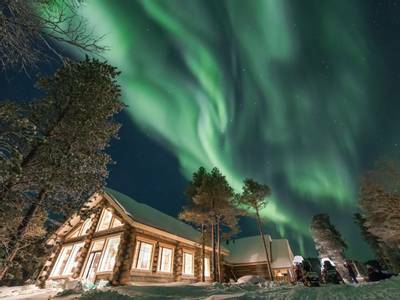 Hunting the Northern Lights and trying unforgettable activities such as dog sledding and snowmobiling really takes the edge off the January blues. 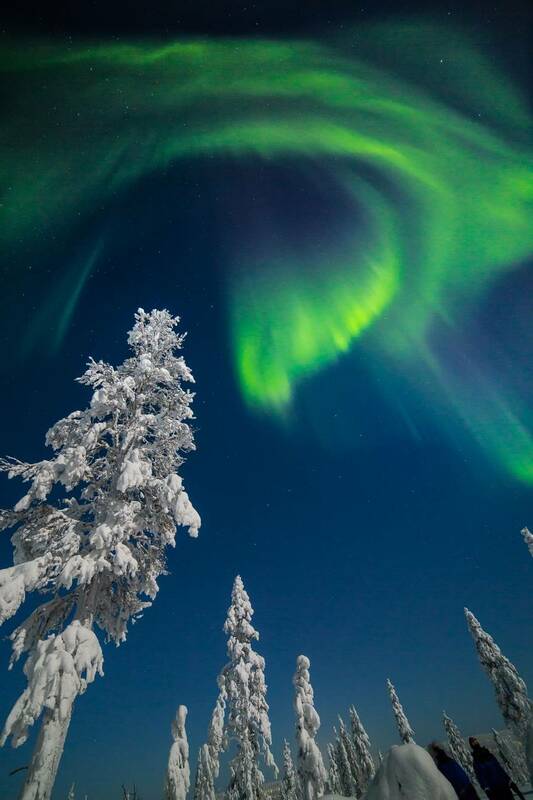 Imagine spending your New Year standing in Finnish Lapland looking up as the Aurora dances overhead. 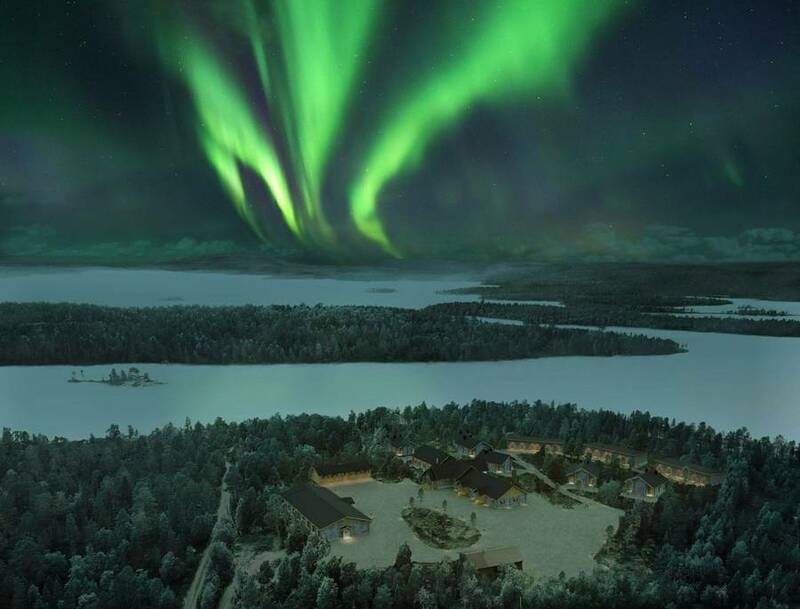 During this four-night break to Nangu, you’ll have this chance as well as enjoying dedicated Northern Lights hunts and amazing daytime winter activities. The first week of the New Year can be a difficult time. At some stage, you have to raise yourself from the food and drink induced lethargy of the festive period and get back to reality. So why not avoid all of that and escape on an unforgettable holiday to Wilderness Hotel Nangu instead? 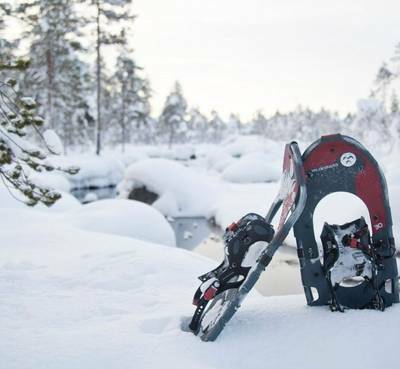 Think deep snow and frozen lakes, think ‘Narnia-style’ forests and white-blanketed landscapes. 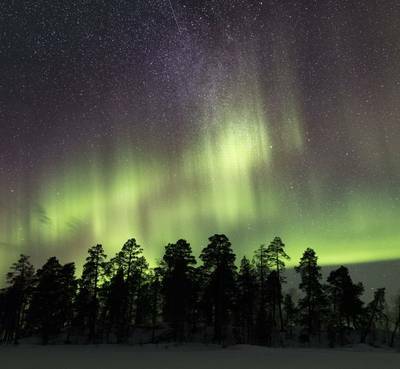 Think of the purest air in Europe, crisp and crackling with winter chill and then imagine the darkest of dark skies alive with the shifting, shimmering and glimmering lights that are the Aurora Borealis. 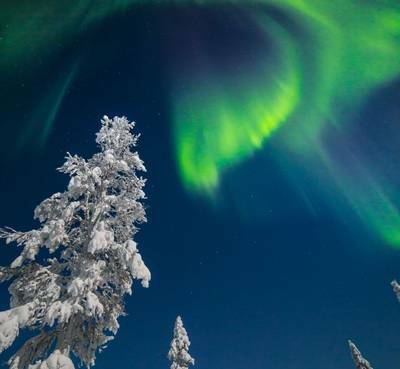 Our New Year Aurora hunting trip at Nangu in Finnish Lapland is the perfect way to extend the festive feeling and avoid the dreaded January blues. During the day, you’ll be out in the wilds dog sledding and snowmobiling. We have also provided some time in which you can relax and take things easy or tailor your holiday with additional activities. 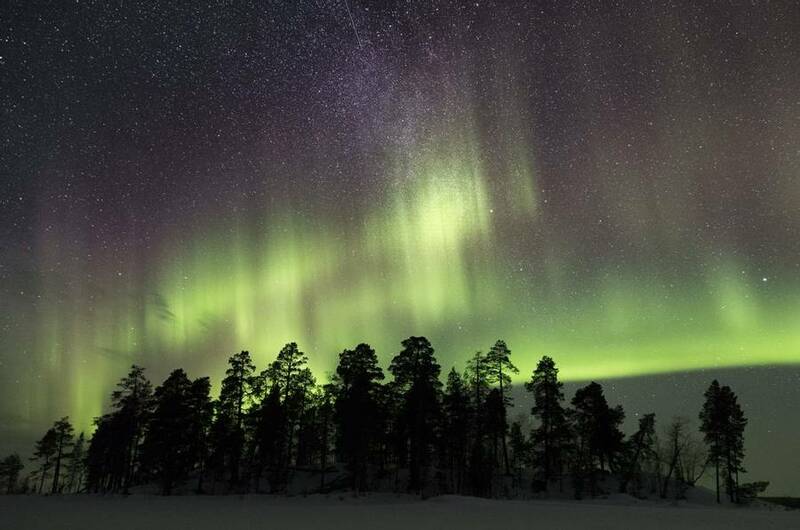 In the evenings, the coal black skies above Lake Inari are perfect for Aurora watching if the weather and Aurora conditions are right. 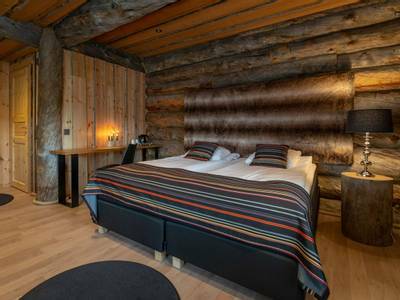 This stunning log-built hotel is well and truly off-the-beaten-track and as a result, there is very, very little artificial light pollution to spoil the show. 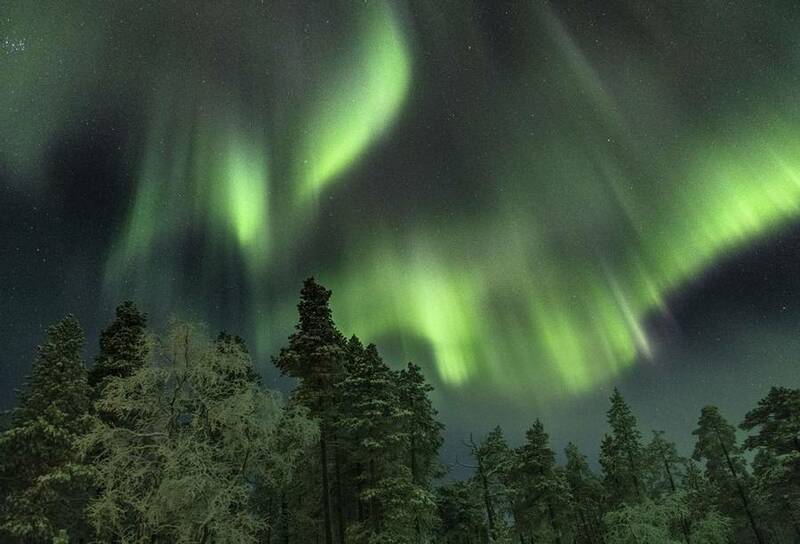 Indeed, many of us here at The Aurora Zone witnessed our first ever Aurora displays close to Lake Inari. Lake Inari is Finland’s third largest lake and its second deepest. 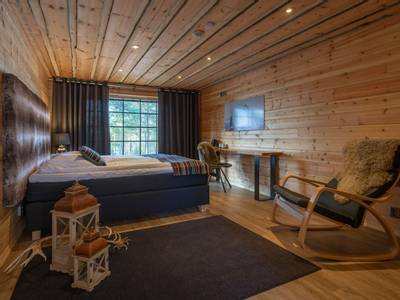 It is steeped in tradition and mysticism and, even today, it plays an important role in the spiritual lives of the indigenous Sámi people. 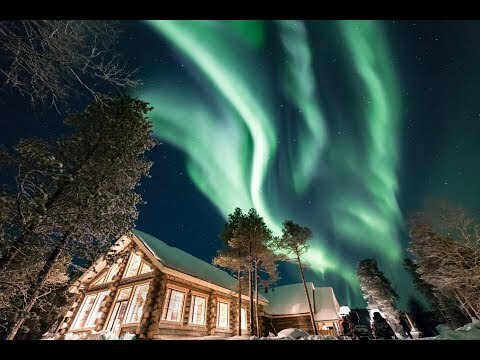 Once you have seen the Aurora dance above the lake, it is not hard to understand why it has gained such symbolism. Arriving at Ivalo Airport is akin to arriving on a different planet. 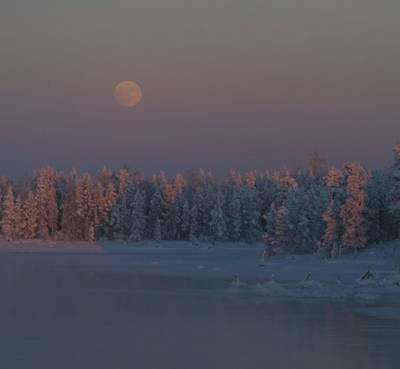 If your day started in a major city like London, then this snow-covered world 250km above the Arctic Circle may be a bit of a culture shock. 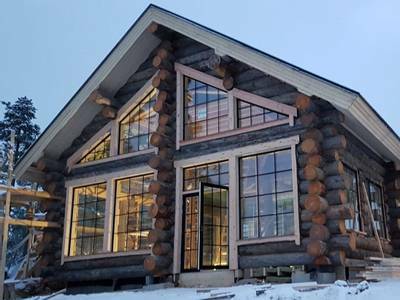 When you get to Nangu after a 30-minute transfer, the log-built building and the welcoming glow through its windows are almost like a wilderness mirage. 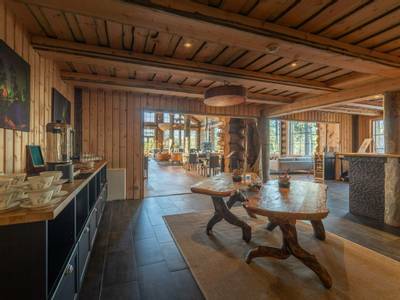 It seems impossible that such a cosy and comfortable retreat could exist amidst these winter wilds. Nangu is stunning. Accommodation this far north is always decent but sometimes it can feel functional. You will have dinner and receive your cold weather clothing ahead of tonight's Northern Lights hunt. 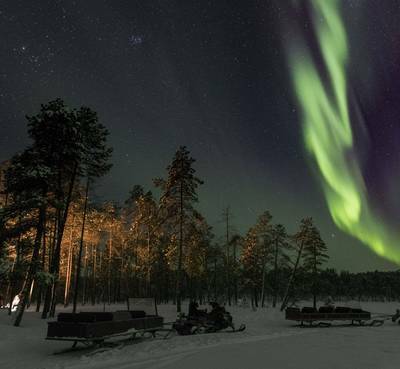 You will travel on a snowmobile-pulled sled to reach an excellent viewing spot at the Aurora Camp where hopefully the Northern Lights will appear above you. A free day today allows you to pick and choose whether you want to relax or choose some additional activities. 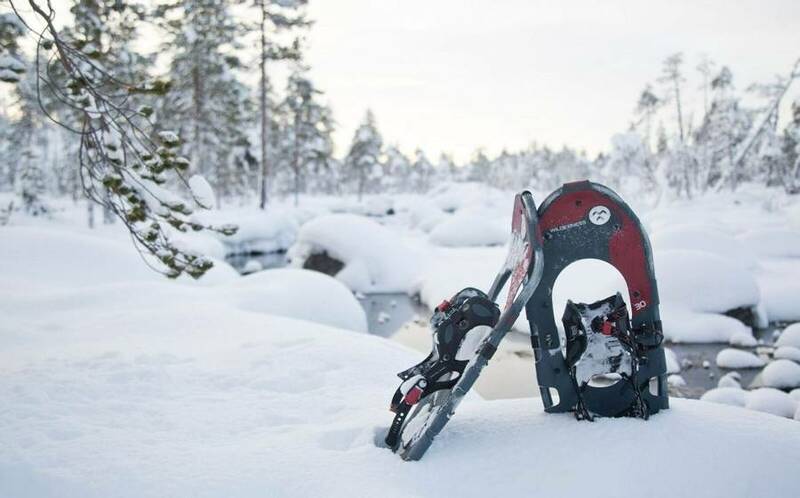 Perhaps a day of cross-country skiing through the forest and over the frozen lake will be the perfect way to unwind and enjoy the tranquil surroundings of fells, forests and crisp snow, sliding across the frozen landscape, high above the Arctic Circle. 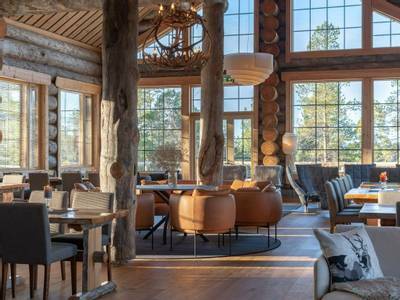 Alternatively, you could simply relax in the hotel and mesmerise yourself with the gorgeous views towards Lake Inari, cosying up in the hotel’s lounge area with a good read. 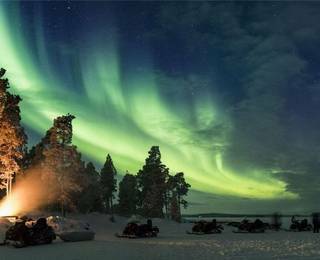 After a day at your own pace and dinner in the hotel restaurant, tonight you will set out with your expert guide in search of the Aurora, using snowmobiles as your transport. Prior to departure, you will be given a full safety briefing and full instruction on how to handle a snowmobile. 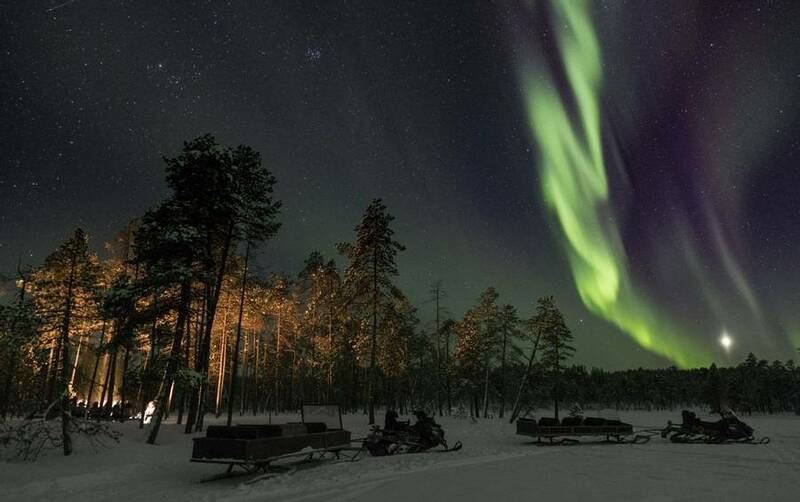 You will then set off for your hunt which will take you to some prime local Aurora viewpoints. Travelling two people per sled, you can swap drivers when you break for a warm drink. Drivers must be over 18 years and hold a full driving licence to drive a snowmobile. Your local guide knows all the key local viewpoints and they will determine the route based on the weather conditions and the Aurora forecast. You will be out for around two and a half hours in total. 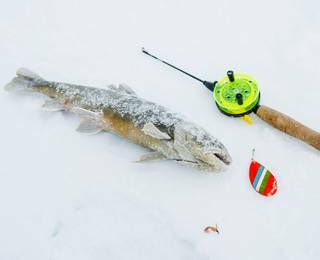 Things kick off in style today as you transfer around forty to fifty minutes to Nellim, a remote village close to the Russian border and home to Wilderness Hotel Nellim, one of Nangu’s sister properties. From here, the dog sledding starts with a thorough briefing on how to handle the team and the sleds. The excitable dogs will be making their enthusiasm for the trail obvious with their eager barks and so we save the photo opportunities for the end of the safari. You’ll then be off on the trail with one person driving the team and the other riding in the sled with opportunities to swap along the way. The landscapes here are simply stunning and as the dogs fall silent as they run, it’s a great time to drink in the vast expanses of winter wilderness. 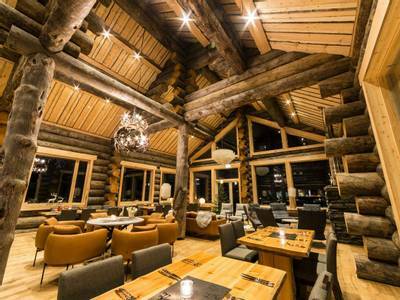 You will be out for around five hours today and lunch will be served at Wilderness Hotel Nellim during the day. You may want to try and fit in a quick pre-dinner snooze though as tonight is New Year’s Eve and so you’ll want enough energy to enjoy the celebrations and the special festive buffet dinner at the hotel. 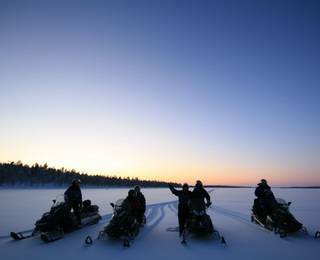 Your final day in Finland is once again full of incredible experiences as you head out onto the ice of Lake Inari for a snowmobiling adventure. The lake is the third largest in Finland and its scale is hard to appreciate unless you explore on snowmobiles. So, following a safety briefing and full instruction, you will head out for an unforgettable safari with your guide leading the way. With two people per snowmobile, there will be the chance for you to change drivers when you break for a campfire lunch in the wilderness. Again, you must hold a full driving licence to drive a snowmobile. In total, you will be out for around 4 hours. 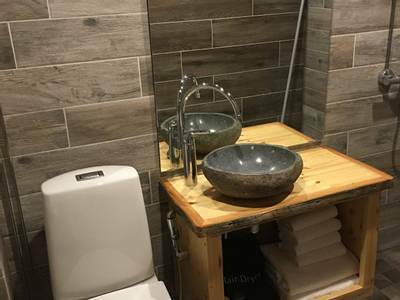 Back at Nangu, there will be some free time to reflect on your holiday before your final post-dinner activity gets underway. Your guide will lead you back out to one of the Aurora Camps close to the lake for another stake-out. 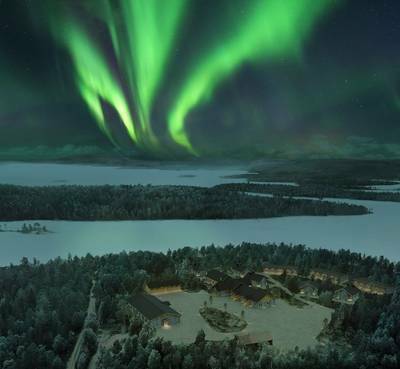 If conditions are favourable there can be few better places from which to watch the Northern Lights dancing overhead. With a little luck, the lights may come and bid you farewell ahead of your departure tomorrow. All good things must come to an end and today it’s time to head home and back to what we laughingly refer to as “the real world”. Still, there’s considerable consolation in knowing that you have successfully postponed the return to daily working life and will have some unforgettable memories to see you through until spring. A packed breakfast will be provided. Many find the idea of driving a snowmobile slightly daunting and jump at the chance to ride as a passenger instead of taking control. However, we know from first-hand experience that you are hugely missing out if you do not seize the opportunity to drive one yourself. Therefore, we present you with a beginner’s driving lesson for those who want a little extra support and confidence before their first ride. Firstly, your guide will familiarise you with the snowmobile and its controls (there really aren’t many), providing a full safety briefing and a driving lesson. 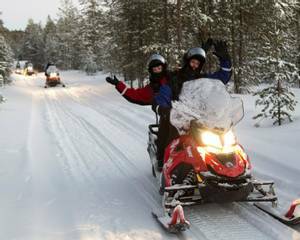 By the time this has finished, you will feel confident enough to set off, two people per snowmobile, on a guided excursion. As you grow increasingly comfortable with your machine, you can pick up the pace whilst enjoying your snow-carpeted surroundings. The distance you cover will depend on the group, but the activity will last for around two hours in total. This activity will take you deep into the wilderness that surrounds Nangu. 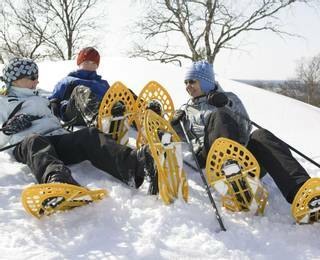 Your snowshoes will be provided, and you will strap them to your winter boots prior to setting off on the trail. Your guide will take you through the stunning winter scenery, while you appreciate the peace and quiet as the snow deadens any sound and only the crunching sound of your feet on the ground is audible. While you walk, your guide will share information and stories about the area’s nature and wildlife. During this activity, you will stop for hot drinks and lunch around a campfire. 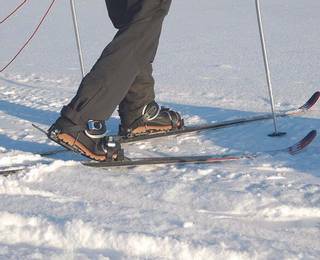 Cross-country skiing is a traditional Finnish winter sport, and a “must-try” when you are here in Finnish Lapland! Do not worry if you have never skied before, as you will be given a full safety briefing and lesson which will include tips and techniques that will help you along. Even those experienced downhill skiers will find this a completely new experience, so the group can muddle along together until everyone finds their feet. Then, your guide will take you out on the trail, keeping to a pace and route that is suitable for the group. Snowmobiling at night is a completely different experience to during the day and it always feels as if you are travelling at a much faster pace. 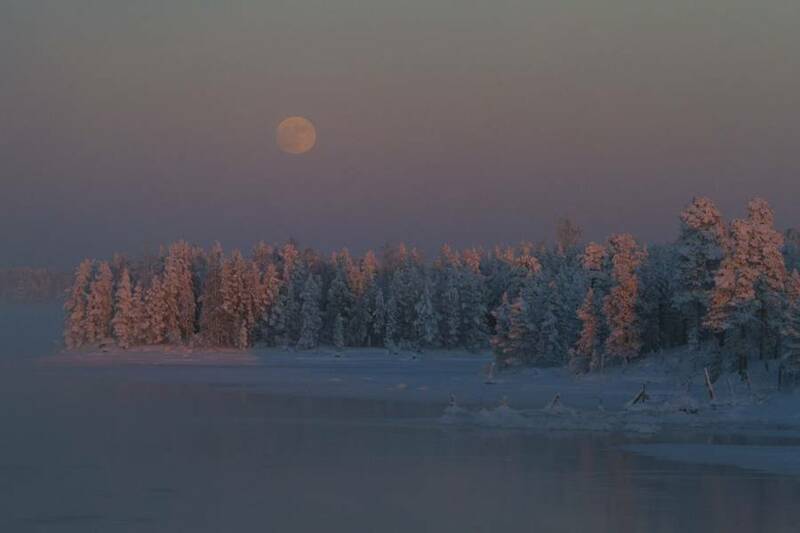 You’re not of course but it can be so thrilling to cross Lake Inari which is shrouded in Arctic darkness. First, you will receive all of your necessary equipment and a full safety briefing. 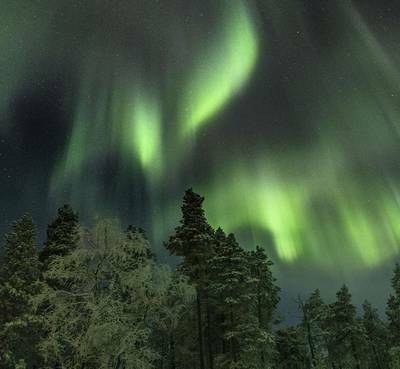 Based on knowledge of the evening’s predicted Auroral activity and the local weather forecast, your guide will then lead the way to what will hopefully be a prime Northern Lights spotting location. The dark, expanse of sky over the lake will hopefully be glistening with green and red swirls as the Northern Lights dance above you. If so, you will all turn off your engines, switch off the headlights and stop to appreciate the fantastic display. Two people will share a snowmobile on this excursion, and distance covered will depend on the Northern Lights visibility tonight. Minimum numbers required for this holiday to run vary from 2 to 8 people (depending on departure date). Maximum 30 people (approximately). Please speak to our Travel Experts for further information. A fantastic & truly memorable trip. The staff at Nangu were outstanding - a brilliant lodge.